Midsumma Festival is one of Melbourne’s more colourful annual events. When it comes to creating signs to help with the marketing of a project like that, it’s an exciting opportunity to take some risks and do something different. 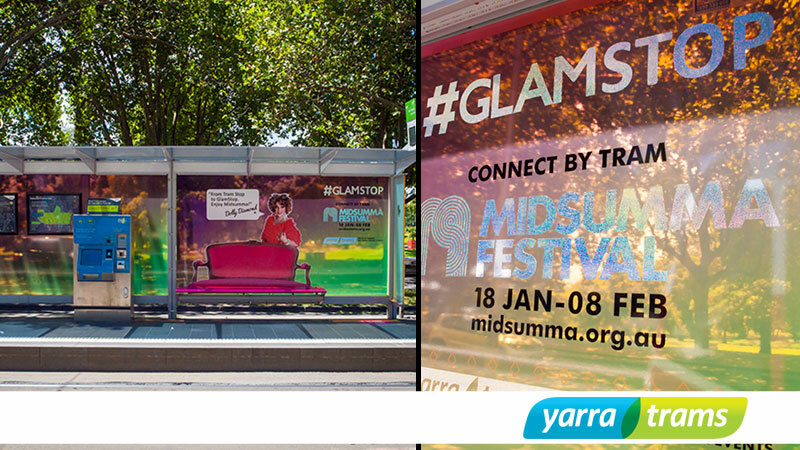 During Midsumma, we were partly responsible for re-naming them Glam Stops – transforming the everyday mundanity of this iconic Melbourne fixture into something fun and different (much like Midsumma itself). Creating effective signage is not a blanket fix. There is no such thing as one-size fits all. When you’re looking at using highly visible tram stops to promote your business or event, there are lots of things to consider. Here in Melbourne, we love our parks and gardens, so even the pizazz of a high profile Glam Stop in the Arts precinct vicinity had to factor this in – and the brief we worked to included creating some eye-catching colour that would still let all those stressed-out workers and CBD travellers enjoy the calming scenery of the greenery surrounding St Kilda Road. We tackled this in an innovative way we’re pretty proud of. The symbol for the Gay Pride movement is the rainbow flag and we used translucent vinyl that was then applied to the inside of the glass tram shelter (using CMYK UV light fast ink profiles) – perfect for taking in the vibrant colours of the rainbow (and all the meaning attached to that) as the sunshine filtered through. We overlaid holographic film for some cool effects (see top image)– adding elements of movement that really brought the promotion of this lively festival to life. We used some precision contour cutting for the vinyl decals on the wing walls of the shelter and the drag queens image certainly stopped people in their tracks. 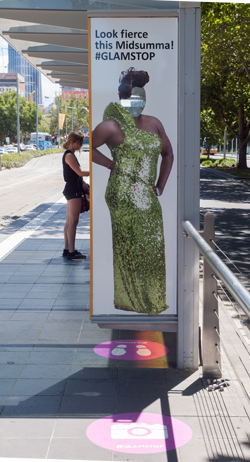 Because the face of the drag queen was laser-cut and removed, it made the signage interactive – inviting people to stand behind the image and stick their own face through. Anything that encourages people to ask their friends to snap a few quick mobile phone photos (and share on social media for a laugh) is a brilliant marketing strategy. It was a relatively simple idea but one that worked and, pretty soon, the image of our drag queen decal was being shared on everything from Facebook to Instagram (and everything in between). At Barneys we pride ourselves on providing a full service, meaning we not only produce and install the signage, we also clean up the rubbish following signage installation and remove all signage at the end of the promotion, leaving all surfaces clean and undamaged, something that was very important to Yarra Trams in this particular instance.